"A workhorse of industry and research, lasers also have a home in the arts. On stage, they've danced with performers. In museums, they've been behind almost magical portraits. For artists, this new tool has allowed them to do new things. However, they'd like to see further improvements in laser capabilities and robustness. Also, for some projects improving laser safety and cutting laser costs are key. 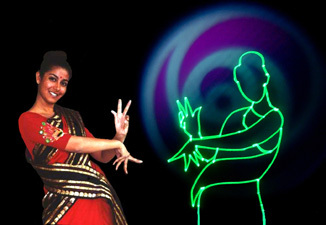 In one case, the light fantastic trips the light fantastic, with laser animation combining with live action on stage. Artist P. C. "Manick" Sorcar, CEO of Denver-suburb Arvada, Colo.-based LaserLight Magic and Sorcar Engineering, is the man behind these scenes. One of his award-winning shows depicts a dancer regaining her confidence, while another shows a demon trying to disrupt the Buddha's meditation. A third, which is under development, will show a little girl dreaming of being underwater, rescuing trapped fairies. In these shows, lasers power the animation. They're projected from the rear onto a special screen with the actors moving in front of it. "The key is to use a screen that will remain virtually invisible, yet show the laser graphics nicely without any penetration or spill over into the audience," said Sorcar. He added that while the screen remains unseen the live performers must be clearly visible. That's done through a combination of lights. For complete story, press here for the online article.